Who’s the Best San Diego Diamond Buyer to Sell Diamonds to? If you plan to sell diamonds in San Diego, this useful guide will help you choose the best place to get the highest price. The first thing you want to do is run a background check on the diamond buyer. This is done by first going to the website of San Diego’s Better Business Bureau. Check to see that the buyer has either an A or A+ rating. The higher the grade, the better. Then go to independent review websites like Google Reviews, Yelp, and Yahoo Local to see what customers are saying about the diamond buyer you are considering. Beware of illegitimate reviews: both positive and negative ones. Unscrupulous competitors sometimes post attack reviews of other diamond buyers, but these are usually easy to spot. They generally appear out of place when looked at within the context of other reviews, and they also are often challenged by the business owner as being a fake review. Meanwhile illegitimate positive reviews can often be identified when you see a bunch posted around the same day, or when the review is quite vague but filled with superlatives (like great, fantastic, the best, etc.). Legitimate reviews of San Diego diamond buyers tend to include specific details of the sellers’ experiences and they are spaced out over weeks and months. One important thing to remember when selling a loose diamond or diamond ring is that a diamond that is equal to (or greater than) 1 carat will bring a much higher buying offer than one which is just below 1 carat in weight. The higher price is because diamonds over one carat are rarer and more sough-after. Also keep in mind that the very small diamonds that you sometimes find in diamond jewelry often are worth nothing or very little when selling used diamond jewelry. You are in luck if the diamond that you are trying to sell to a San Diego diamond buyer is a branded one which is in demand, such as Hearts on Fire. These branded diamonds bring a premium price on the re-sale market, so don’t be fooled by a diamond buyer who tells you that a branded diamond means nothing. In certain cases, it can mean a lot of extra cash in your pocket if your branded diamond is popular and highly sought after. It’s not only branded pre-owned diamonds that can bring a premium price, colored diamonds can also bring higher purchase offers. For example, you will get more cash for a high quality used diamond that has a pinkish or bluish hue than you would for a clear diamond of similar quality. Sellers of these types of rare diamonds should be sure to go to a diamond buyer who has a provable track record of dealing in such unique precious stones. Whatever kind of used diamond you are selling, keep in mind that Clarity and Color are critical factors when evaluating the worth of your diamond. To get the best diamond price the quality must be high for both of these attributes. Your San Diego diamond buyer should appraise all of your diamond’s important attributes: color, clarity, cut, and carat weight (known as the 4 Cs), free of charge. Owners of large diamonds often have a diamond grading report, which was issued to them when they bought the diamond. This can make the process of selling your used diamond much easier. That is, if the grading report comes from an internationally respected gemstone lab like the Gemological Institute of America. Here is an excellent overview of how to read one: reading a diamond grading report. 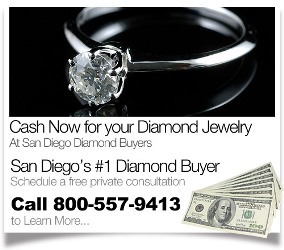 So how much money are you going to get by selling your precious gemstone to a San Diego diamond buyer? Well, the bad news for most people is that you are not going to get close to what you paid retail for it. Retail jewelers sell diamond jewelry at very high markups. So, if you bought your loose diamond or diamond jewelry from a San Diego storefront jeweler, you are likely to receive an offer that is 20-40% of what you paid. To get a better idea of what a San Diego diamond buyer might pay you for a diamond, go to BlueNile.com and a couple other big online discount jewelry sellers. Price a GIA certified one carat ideal cut diamond that has F color and VVS1 clarity. Compare prices and take the lowest one. Then subtract 60% from that price. The remaining dollar amount is what you are likely to be paid if you sell that diamond to a California buyer. Lastly, when selling your diamond, it pays to stay local. You are likely to get pain more from a local dedicated San Diego diamond buyer with a track record of honest offers and ethical business practices than a nationally run operation with high overheads.